The life of a movie and TV aficionado is kind of hard, if you think about it. Say that there's a blockbuster movie that you want to see. Do you go see it in theatres as soon as it comes out? That will cost you a pretty penny. Do you wait until the movie has a physical release, and then buy it? It's still kind of expensive, there's no telling if you'll even watch the movie more than once, and the player (or disc) may stop working or become obsolete. And then there's the case of TV. There are a number of different things that can get between you and your favourite show. The channels in your provider package aren't airing a new episode for another week, or maybe more. Or maybe the show is on a premium channel that you have to pay extra money to subscribe to. Or maybe you don't have enough tapes or space on your digital recorder to save your show and all of the other stuff that you want to watch. That's why many people who aren't satisfied with these options turn to Netflix.com. With Netflix, you can watch as many movies and TV show episodes as you want. And there's no need to wait for a theatre to post a show time, a renter to have a physical copy in stock, or a channel to air the next episode. As long as a movie or show is available on Netflix, you can watch it whenever you want. And all of it costs as little as $8 a month. So what is Netflix, in a nutshell? Netflix is a website that allows you to watch movies and television shows whenever you want and as often as you want. A monthly subscription gives you access to all titles available on Netflix for your country, which you can watch on your computer, mobile device, smart TV, or other digital media player. Netflix is a media streaming service. What this means is that you can watch a movie or TV show episode as the file is loading, as opposed to having to wait for the entire file to load before you can begin watching. Our article on Internet TV explains more. Hemlock Grove -- Set in the fictional town of Hemlock Grove, Pennsylvania, this show examines the unlikely friendship that develops between a newcomer to the town and the heir to the town’s wealthy family as they jointly investigate a series of murders and other strange occurrences. 1. Sign up for a Netflix account, and choose your pricing plan. When you sign up for Netflix, you'll be given a choice of different subscription options. Depending on which one you choose, you may be able to watch Netflix on multiple devices at once with the same account, or be able to watch movies and shows with higher-quality video resolution. But all of them will give you access to the full library of Netflix titles available for your country, so you won't need to worry about missing out if you go for just the basic plan! Oh, and one more thing: the first time you sign up for Netflix, you can use any plan that you want for free for a month, so you can determine whether or not you'll get your money's worth out of Netflix! 2. Set up Netflix to work on the device of your choice. As we mentioned before, you can use Netflix right from the website, but there are a bunch of other ways to watch it, too! For example, you can hook your computer up to your TV and watch Netflix that way. Or, you can run Netflix on your TV through a digital media player (e.g. Apple TV, Amazon Fire TV, or Google Chromecast), modern video game console (e.g. Sony PlayStation 3, Microsoft Xbox, or Nintendo Wii), or some Blu-Ray players or cable/satellite boxes. Some advanced TVs can even run Netflix directly... no peripherals needed! A complete list can be found here. 3. Find and follow your favourite titles, or get suggestions on what to watch next. There are lots of ways to browse and search for the perfect movie or TV show to watch. You can go by what's currently popular, narrow your search to just movies or TV shows, filter by genres, or even look for a title by its name or who stars in it. You can also tell Netflix your taste preferences, and it will recommend new titles based on what you like and what you've watched previously. 4. The Netflix video player puts you in control of your favourite titles. 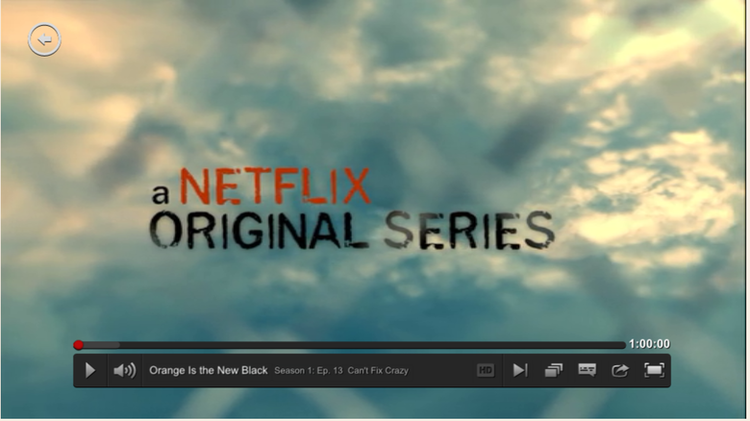 Once you find a movie or TV show to watch, you can use the Netflix video player to watch it however you like it. Start and stop the video, skip to a particular part, or skip between episodes of the same TV show. Adjust the volume or video quality, enable subtitles if you're hard-of-hearing (or the title isn't in your native language), or make the player take up your entire screen so that you can see every detail. You can even tell your friends on social media what you're watching right from Netflix! 5. Watch titles the old-fashioned way with DVD.com. If you're happy watching movies and TV shows on physical media discs (or don't have the Internet or device specs to watch Netflix the way that you want to), you can try out DVD.com, Netflix's service for renting DVD and Blu-Ray discs. For low monthly rates, you can rent up to 3 titles at once from DVD.com, keep them and watch them for however long you want, and then send them back in the mail once you're done. You can even set up DVD.com to send you new titles as soon as they get back the ones that you're currently using! If watching entertainment on either the silver screen or the small screen is getting to be too much of a financial and/or logistical hassle, give Netflix a try. Our Netflix course will show you everything that you need to know to get it up and running, from creating an account to finding what you want to watch to adjusting your settings and preferences. Plus, you get a month free, so there's very little to lose. Start watching movies and TV shows when you want and as often as you want for an affordable monthly price with Netflix! Don't forget to have a look around Techboomers.com, where you will find lessons on over 60 other websites and Internet applications that are popular, useful, and/or just downright fun!